Item is a photograph of a soccer field in winter, with Lennoxville High School in the background. Item is a photograph of a long, covered bridge located in Lennoxville. Item is a photograph of a short, covered bridge located in Lennoxville. 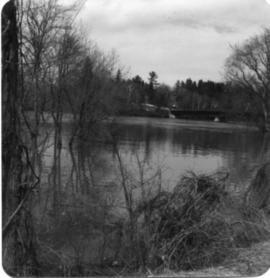 Item is a photograph of Bishop's University, taken from a bridge that was over the Massawippi River. Item is a photograph of Bishop's University located in Lennoxville, taken from across the river. Item is a photograph of Nelson Andrews' Taxi Service, which was located at 2 College Street, Lennoxville, along with what was probably Haddon's gas station. Item is a photograph of Bishop's College located in Lennoxville, with the St. Francis river in front. 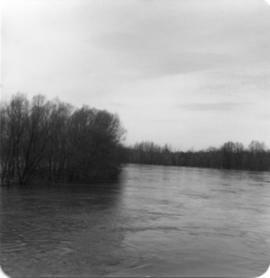 Item is a photograph of the Massawippi River flooded in Lennoxville, with a building in the background. Item is a photograph of a road that leads to Lennoxville, with willow trees on both sides. Item is a photograph of the last Canadian National Railway steam train used, as it passes through Lennoxville on its way to Portland from Montreal. Item is a photograph of a Canadian Pacific Railway train located near the Lennoxville brickyard. Item is a photograph of a Canadian Pacific Railway train wreck, which occured between Lennoxville and Huntingville. The item is a photograph of a group of young men in the quad in Bishop's University in Lennoxville in the early 1900s.